All fun is over, Jan and I are having same age again! Gosh I am late this morning, I slept longer than I usually do. It doesn+t hurt, but suddenly the day seems to be so much shorter. Jan´s birthday yesterday was a quiet day but nice. I just went out to buy us the mussels and I must say it tasted very well and I think Jan was pleased with the little `surprise`dinner LOL. The weather here is still not too bad, I think in the eastern and south part of the country they have more trouble with winter weather, but here we have short snow or melted snow showers, and when I was out yesterday I had to cope with a hail shower. But it was ony for 2 or 3 minutes and that was it. At the moment it looks nice outside, little wind and sunshine with lots of blue sky. I spent some more time at the computer yesterday and almost finished it. I am in the middle of making the previes, so I will be able to upload it this weekend. But I will have topick my time for it, because I realize that there will be speedskating again this weekend. Oh , it is just for the World cup, so there will be only a short broadcast about it. Although it can be important for some skaters, they can earn a starting place for other events. So during the day, I will have some time, and then in the weekend we always have a rather full tv watching program LOL. One day there isn´t almost anything really nice or interesting and another day it is packed full with series we follow, lots of detectives, some quizes and such. Jan will have to look what he can record on dvd and video and what we will be watching . I have a first part of a new kit for you today. I named it Happy Moments in a Box. Guess we all have somewhere a little box with some things in it, that are dear to us and when we take it out every now and then they bring back some happy moments. Of course we have those moments in our mind and heart, but sometimes it is nice to actually see and touch the things that belong to that moment. P.S. 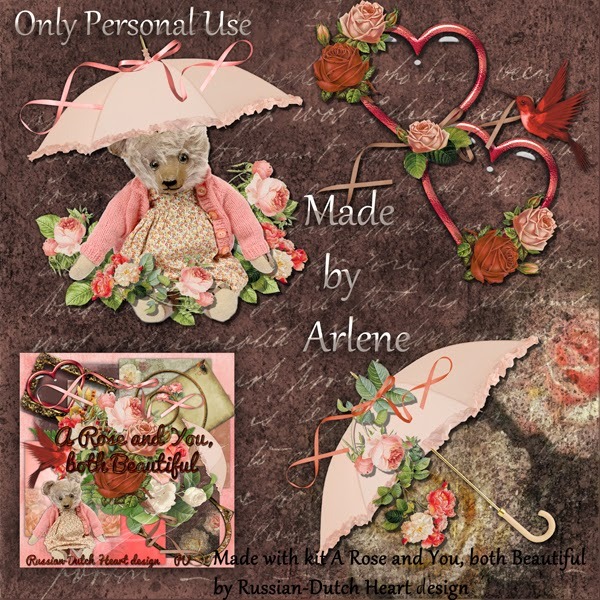 Just rememebered I had to tell you that Arlene has a wonderful new freebie on her blog! 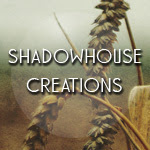 Find the link in my sidebar, take the time to look at it, it's worth the few minutes! One more day I will be the oldest LOL! Watched the news this morning and saw all that snow that came down in parts of the US. Gosh, that really is a big amount fo white stuff. I am glad we didn;t have such weather overhere and I hope it will stay away! Imagine, we had some nights with a little bit of frost ( about -3 or 4 C at the most) and already there were troubles with our our trains. some couldn;t do there schedule, came in too late etc. etc. I cannot understand that at all. In the countries around us they have the same kind of weather or even more frost and also some snow, and I don;t hear anything about trouble with the tracks. Amazing that here the railwaycompany still cannot cope with that little bit of frost. Yesterday I decided it really was time to go out and have some fresh air, and i did some grocerie shopping. And it felt good to be out for a while. Weather was really cool, most annoying was the bit of wind, that made it fell colder than it actually was. But it was dry and sometimes we had even a spot of a sunray coming through the clouds. Still haven't heard about the volunteer job and I think it is taking too long, so I will look for something else and if there might come an invitation for the 1st, I always can say no thanks, I now have something else, right? The last couple of days I did some more designing at the computer, finished already another kit, and have already 3 papers made for the next kit. Whooo, not bad for an older lady hahahha. Talking about age, I will only be one day more the oldest of our family, just today and then it is over. Yeah, tomorrow it will be the 29th of January and Jan is having his birthday, and will be 62 too. We will not do something really special, but I will spend some extra attention to the dinner tomorrow. I am thinking about cooking a big pan with mussles together with a few dipsauces and some french bread. Monday I made a phonecall( at last!) to Heidi again, just to hear if all was okay there. She still is having trouble with her supposed allergy outbreak, it is taking now about a month it is bothering her. She is still under medication and control and she said it slowly is getting better. Hmmmm, very strange. Her daughter Séverine is doing very well at high school, almost all the time getting high marks. 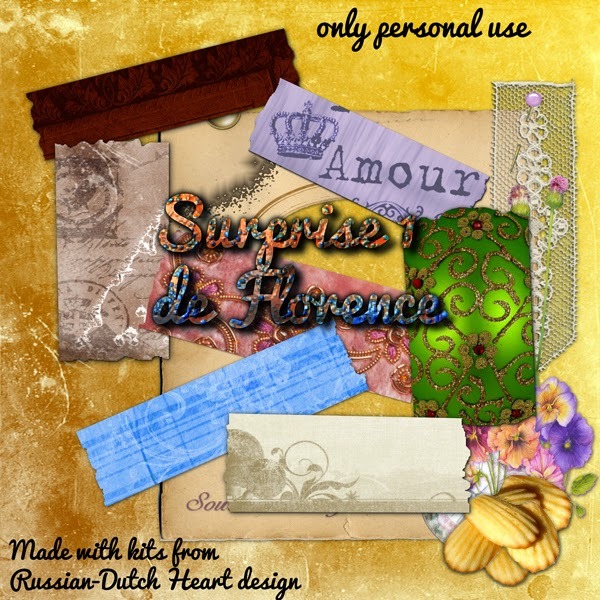 Today i have a freebie for you from Florence( she sent me a LOT of stuff, so more to come in near future for you), she has made some tape pieces from all kinds of papers out of my kits. 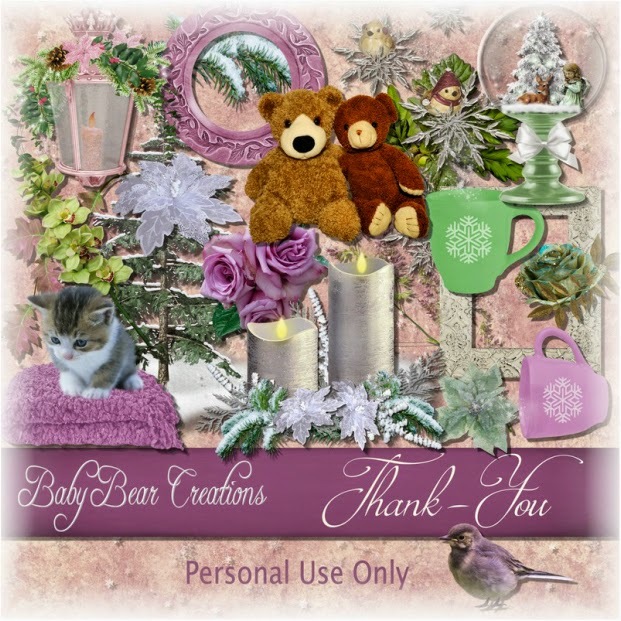 I thought it would be nice for your layouts to have those elements and I also tossed in a cluster frame she has made. Wishing you all a very nice day, hope everybody dealing with the snowstorm in the U.S stays safe. Thanks for your visits all the time! Perhaps great news on the medical front? We really had a quiet but oh so nice weekend. I even had patience and inspiration to sit for a longer time at the computer to design on the new kit, which is finished too and I even started with another one. Wow, that didn;t happen for a long time. Normally on Saturday we have an easy meal, something quick, or at times just sandwiches, but this time not. Saturday afternoon I made made little meatballs with minced meat, all well seasoned with pepper, salt, lots of garlic, chopped black olives. Then I made a tomatoe sauce with little tins of tomatoe puree, seasoned that well too, then first fried the balls in a pan then added the sauce and let it simmer for a while. For dinner I then cooked a bit of macaroni and that was our meal. It tasted very well. As I had still enough meat balls left, we ate them yesterday, but then I made some cooked potatoes and I had still some Chinese cabbage, I cut that in bigger pieces and fried that in a pan in some olive oil, seasoned just with some pepper and salt. also tasted well. I still didn;t hear anything from the volunteer job, till now. Hmmmmm, hope they will let me know something today. and I didn;t hear anything at all from the guy from social security! Now that wonders me, I even think it is unpolite. The only excuse for him would be that he still has been ill last week. I think that if i don;t hear from him somewhere this week, I will try to write a letter to him(make a copy of it for myself, of course). I can do that, because I have an address. Let's see if that gives any reaction. If not I will go there in person, again, somewhere next week perhaps. This Friday there was an interview in a program on tv that was really interesting. It was about the research and progress of stem cells, this specially for the liver. I found and article in a Dutch newspaper about it, let Google translate the website and I will post it here. I think that it would be marvelous if in really near future it could be done in hospitals. This technique would also be possible to performe for other organs in future. The research and result was done by a Dutch researcher( of course together with a lot of other people, also world wide). Well, I let you be the judge of the fact if it would be good or not, but I think if this "find" will be used for the good it could be an amazing step forward in helping and healing people. Cultured stem cells injected in a patient with liver failure, and the diseased organ eventually recovers fully. Researchers at the Hubrecht Institute and the University Medical Center Utrecht seem to have put in a stunning steps downright revolutionary development, invented in the Netherlands. The researchers, working on this for 15 years in relative silence, thinking that culture stem cells in the future can be a substitute for donor organs. Organ transplant would then no longer required; an injection of stem cells the patient could give a replacement organ. Until recently, it seemed impossible to keep healthy or diseased tissue of patients alive in the laboratory, let alone to be amplified. But according to molecular geneticist and research leader prof. Dr. Hans Clevers, his research group succeeded in developing a culture system for both human liver stem cells as healthy stem cells extracted from cancer tissue of the pancreas . The scientists report their experiments in two articles appearing this week in the American trade journal Cell. ,, Fabrics decay and break down, "said Clevers, who since 2012 has been president of the Royal Dutch Academy of Sciences (KNAW). ,, The human liver, however, has the feature that it can repair themselves with their own stem cells. This body took us years ago with the idea to see if we could multiply these cells in order to let them repair livers or completely leave it 'rebuild'. That is success. " It appears possible in the laboratory to grow on from a single liver stem cell into a fully new liver in four months. ,, All analyzes show that cultured tissue genetically not differ from healthy liver tissue and also very stable, "said Clevers. This principle should also be applied in the distant future, lungs, kidneys, hearts and other organs. Cultured human "mini-livers' have been successfully transplanted into mice with liver damage. Critics, however, fear that cultured organs perish in cancers. Weather here is still not all too bad, we have temperatures several degrees anove the zero point, which is always nice. It might get a bit colder later this week, but for now it's okay. Only nasty thing is, that when temperatures go up a bit, often it is accompanied by rain. Still that is always better than loads of snow and ice. I saw on the news that in the area of New York and Boston a real snow storm is acting around, I hope for everybody living there that it will be gone soon too. Although fresh fallen snow can be beautiful and even fun, it shouldn;t last too long, because then it causes trouble. Is there more to tell or ramble about? Hmmm, don;t think so. 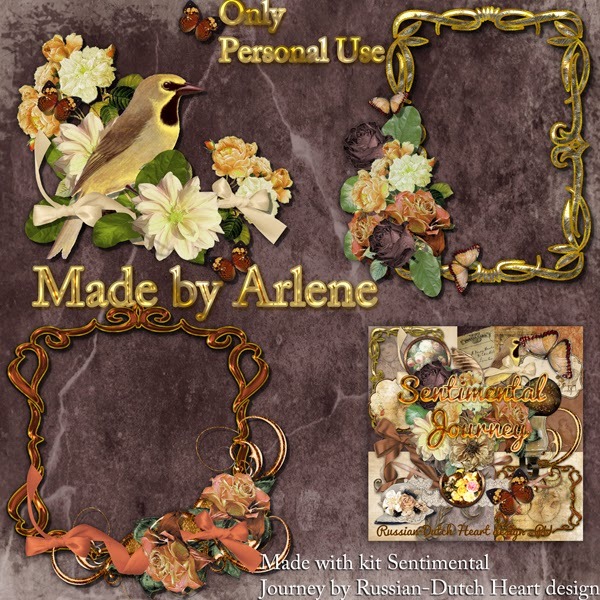 Well, then I cna end this post with a fantastic beautiful freebie from Arlene, 3 clusters made with the Sentimental Journey kit. 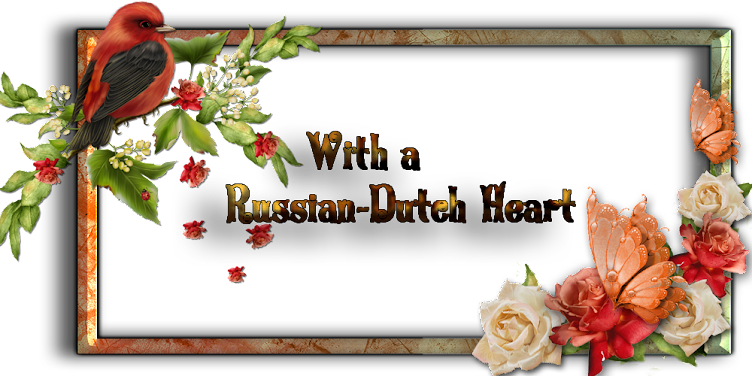 Don;t forget to go to her blog(link in my sidebar), she has a freebie there for you too! Perhaps a strange post title, but Wednesday I just couldn;t get warm. It was warm enough in the house, and not extremely cold outside, but during the day I had cold feet, cold legs, cold hands and arms, terrible. Guess I didn't moved around enough, perhaps, but finally I took a fleece "coat" I once received as Christmas present and wrapped myself in it. Oh, it still took some time, but slowly I got warmed up. Well, I almost stayed all day wrapped in it, and I felt a lot better LOL! Today the weather looks okay, sun is shining at the moment, although the temperature will not get higher than about freezing point. I'll do some shopping today, because tomorrow there is expected to come some rain and more wind, even might be a little melting snow or something like it. Till now I didn;t hear from the volunteer work, perhaps later today I will get a phonecall or mail with either rejection or invitation, whatever the answer will be, I would like to know now, if it is a rejection I can start looking for something else, and otherwise I can prepare myself for the "job". Oh my, government has found something new to introduce. We already have an "own risk"to pay for health care, but now they have the idea to introduce an extra "own risk payment"for young people( age of teens and even younger) who need extra care for mental help. As they have no income the parents will have to pay, which might get as high as ca. € 1500,00 a year! Every normal thinking person can figure out that certainly families with a minimum income aren;t able to pay that on top of all the other costs of living. What will be the result of that measure? That parents will wait asking for help and that young kids that should have some psychiatric help or at least this kind of help will get worse and cannot grow up to sound people. Perhaps I say it a bit in the wrong words, but I think you will understand what I mean. It is understandable that government tries to keep the costs of health care as low as possible, but I have the feeling they cut into the wrong areas of health care! I should think that there are still other areas of the expenses of the government that could do with less money, and put that "found"money into health care and care for the older people, instead of closing elderly homes! I better stop now, otherwise this will be a VERY grumpy and despressing post LOL! Yesterday I did a few things in the house, also gave Jan a bad needed haircut and also started already with a new kit. I hope to go further on it this weeekend and finish it. 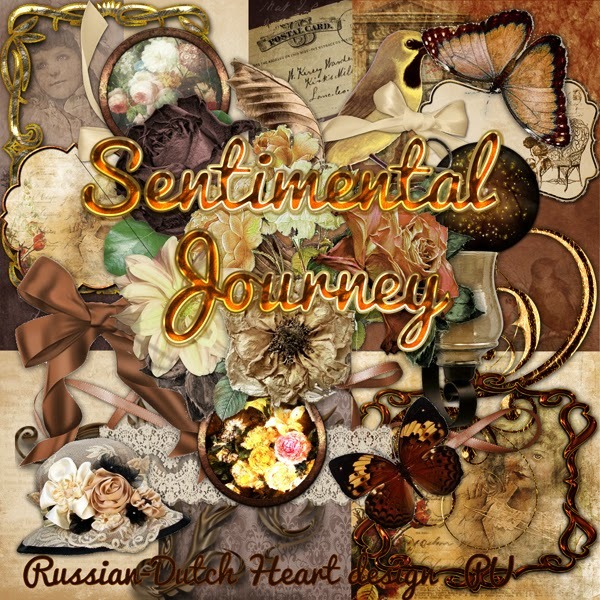 Today I have the second part of the Sentimental Journey kit for you. There are still little things that can make us happy, but they are becoming less and less, it looks as if governments take away all nice things that make life livable, and worthwhile and possible! Still wishing you a wonderful weekend ! Here I am again, with little update on me LOL! Oh my, I really had no spirit on Monday to make a post. Not that it was a bad day. In the morning I just woke up at a good time, so I first did a check on my email. That sometimes takes a bit of time, specially when i want to answer on several. Then had to check a few things on internet, and then had to take a shower, then a cup of coffee, to really wake up hahaha. But it was nice to do all quiet, not hasty, and was ready on time to leave for my appointment for the volunteer job. I was lucky it was rather good weather, dry, even sunny, although the temperature was low. I found the address easyliy and was there rather early. Okay, no problem, I went in and had to wait just for about 5 or 10 minutes. It gave me a chance to look around at the reception there. What a hectic and bit of chaos. Not really a chaos, more an organized one, but I already understood why they were looking for help at the reception! The interview went okay, I think, the man I spoke with, was a nice person, about half my age, but who cares about that? He told me they will have more interviews during this week, but they will let me know this week if I am picked for the job. After the interview I went home again, but I didn;t take the tram, no, I walked back. It was such nice weather, although a bit cold, and it took me only about half an hour. I had a very nice mail in the afternoon from my niece in France. We don;t have a lot of contact, but every now and then a little message, to keep updated. She is such a sweet person, as well as her whole family. Today I received some photos, and gosh, all the kids are looking soooo adult( somehow they always stay in your memory as the kids you saw when they had about 12 years old LOL). Yesterday I didn;t do all too much, except for some shopping for groceries, just the usual actually. Slowly the papers are coming in I need for the tax office. Yes, that is coming near too, although this year we have one month more to fill them in. Not quite sure why, probably because they cannot cope with all the changes in the taxes. It will just be the case of assembling all, then make copies and send them to our accountant. Oh yes, it will cost a bit of money, but it is worth it. During the weekend i finished a new kit, and I could make the preview and upload yesterday. I made the download in 2 parts, so one for today, the other will be on Friday. Hope you will like it and can use some of it. Nowadays i have some inspirational trouble, to actually start a kit. Once I have the idea and colour pallette it goes rather well, may be slowly, but steady. I think I have at the moment so many things to think about and do and remember to do etc, that the designing comes a bit on 3rd place or so. Okay, some day it will get better again. The kit is named "Sentimental Journey". Have a wonderful day and keep smiling. I will be posting tomorrow. I did have time yesterday due to my appointment and when I was back home again, I had no real energy for it anymore. All problems resolved, I hope! well, it was a kind of hectic week, with all the problems around my appointment at social security department. I´ll try to tell it in a short way(because otherwise I get pissed again LOL). Didn´t get any phonecall. Then in the `working file ´I got a message which didn´t help much, oh yeah they came up with another phonenumber, but it wasn´ t valid! Tried some more here and there, no luck. So I finally decided to go in person to the office on Wednesday afternoon. What a good thing I did! Explained the whole situation to a lady at the receptioncounter, and first answer was that they had no phonenumber! Can you figure? Okay, I was already happy she found me in a file on the computer, but the guy I had the appointment with, didn´t put it in, but more interesting was that he appeared to be ill! How nice! If I had gone the next day to the appointment I did that for nothing! So far for good communication! No only way to have a kind of contact with that office is through a general council number, but you´ll never get a direct person to person call at once. So if I get another appointment(they assured me that the guy will get in contact with me) I certainly will insist on getting some honenumber or at the least an email, to be able to get in touch with my so/called coach!!!!! To keep it short, the lady typed the whole thing in an emailreport, so I am covered if there might arise any problems. I kept rather quiet at the counter, I surprised myself LOL, but once left there you could see thinderclouds and nasty words coming out of my head ROFL! Still I am glad i went there to avoid problems. More wicked was, that I moved my interview for the volunteer work from Thursday(would have been at the same time as appointment at the social security). And now all would´t have been necessary. I have my appointment now on Monday. Hope that will go well and without any tricky things. Jan had his appointment with the cardiologist in the hospital, for evaluation of the scan. All was in good order, at the moment there is no need for another operation to place a sten. So far so good, At the least some good news. He will have a control appointment only next year again, unless he experiences some trouble, then he always can call the doctor there. Wow, I am glad we can have some quiet days now, we kind of celebrated that yesterday, hahaha, with watching till late night(and I mean really late ), some episodes of a really good serie, called Homeland. We now watched the whole season nr. 3, but Jan already registered some new episodes on dvd from the new season nr.4! Gosh, it is of course fiction, but so exciting and I think several things in it are really based on realility. I didn´t do all too much yesterday, although I went out for some food shopping, that is done with for the week. So I really want to do something about the house today, it is not the exciting stuff, but becoming necessary. I will be okay with that, when I really get into the moving part, it will take perhaps an hour and that isn´t all too much. One good thing is that I continued for a little while on my new kit. Perhaps I will have it ready by next week. Still, I didn+t want to leave you without a freebie and I have a very nice one. You will get 3 clusters, made by Florence. I think I will have to call her also a Creative team member, just like Arlene. 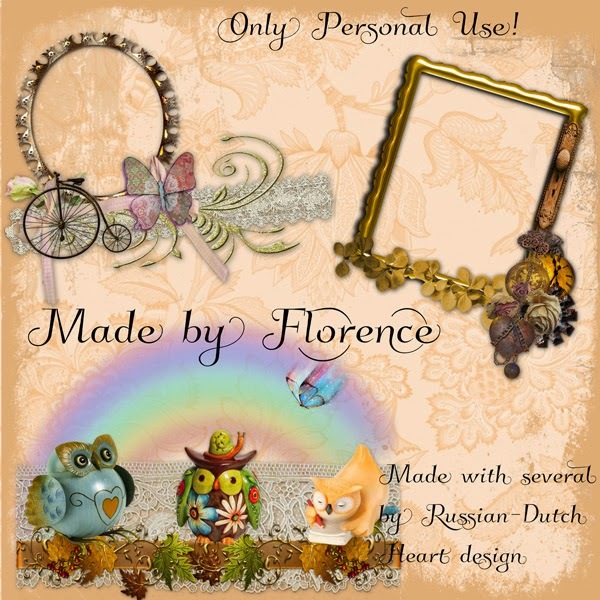 Florence has sent me lots of stuff again, so somewhere next week or so I will have something lovely from her again to download. 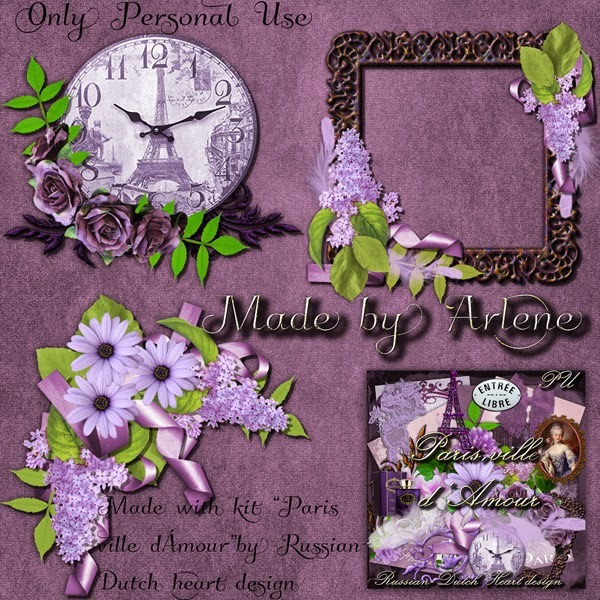 She is a wonderful lady, and doesn´t have always an easy life, I will not tell details, but the scrapbooking helps her and I am so thankfull that she wants to share her creativity. So if you like her work, every little thank you for her would bring her a sunray! Don't talk about councils to me! Talking about the weather it isn;t good. still lots of rain and wind, so it is still rather dark and grey, hope this will change all soon a bit. But, okay, you can always make a phonecall, right? I spent about an hour or no, more, to get a kind of answer! Most simple would be to contact the devision office and ask information. But......they don't have a phonenumber! Only way to get in contact would be by internet, via a site where I have a file, where you have to log in with a special code and leave a message there. Do you believe that? But.. I tried it another way. Via lots of phonecalls I finally ended up with a general phonenumber of the council, where you have a department for social security stuff. I was lucky to get a real nice lady there, who seemed to understand the problem. (If you don;t appear or too late on an appointment you are bound to have a penalty, meaning cuts in payment). She couldn't set me through to the devision office neither, they don;t have a phonenumber either. But I was lucky to remember the name of the person I had the appointment with, so after some time, the lady found me in records, saw I had already been there twice, but couldn;t find anything about the new appointment, but I had the name right, hoorray. Now They had a phonenumber of the civil servant but aren;t allowed to give it to anybody. They will try to reach the civil servant and the lady promised me that i would have a phonecall from him within 24 hours. ( already checked on my "file", nothing there). Crossing my fingers at the moment that he will really phone me today, because the appointment is for tomorrow. If I don;t have a phonecall this afternoon around 14.30-15.00 , I should phone the general number again. Can you imagine it has to be so difficult to get some simple information??? I think that if I dont have that phonecall this afternoon, I perhaps should go to the office, to see if I can get any information or contact with the guy. Then Jan has to stay put at home, in case a phonecall comes in when I am away. I get very pissed about such things, the more because I do all possible to get the information, and if i am not succesfull, it of course will be "my fault" with all consequences. Then you will have to go into appeal, perhaps, but probably will have no success. Hmmmm, let's just wait patiently part of the day, perhaps all will be solved later today. I have a bit brighter note too. I also made a phonecall for the volunteer work at the refugee help office, had a short conversation with a nice guy, he asked me to send a short mail with a cv. So i did right away, and this morning I found a reply in my mailbox with invitation for an interview. Hoorray, that's something. Only nasty thing is, that it is also tomorrow, probably the same time of my interview with social security guy, so I will have to phone and ask for another date/time. Pffff, sometimes life isn;t going very smoothly. Jan went to his scan yesterday, came back home after it, kind of broken! No, not because of the scans he had, but the bench he had to be on, was so hard, that he had serious back-trouble after it, poor guy. So after he came back, he first sat down for a moment and then he lay down on the couch to take a nap and give his back some rest. It helped some, but I saw he took his painkiller early evening, and he only takes it when it really necessary( he has a rather high pain threshold). Hopefully today he will have less trouble with it. Tomorrow he has the appointment with the doctor for evaluation. so we both will be "en route" part of the day. I was so grumpy after my efforts of the phonecalls, that I didn´t do very much else rest of the day LOL! Washing machine was filled, so I turned that on, and that´s about all. Still something good came of it, because I started a new kit. Will take more time to complete it, and with all those appointments and such, I will need several days more I guess. Still a start has been made, which is something. And now the preview and downloadlink of the clusters. Have a very nice day and cross your fingers for me that I will get a phonecall soon today about the appointment! Storms around, and i don;t like hard winds! The whole weekend we had a really hard wind blowing, at times stormy, and that will go on for the next few days. I saw some images on the news, and the sea looks really dangerous at the moment, with high waves. There isn;t yet any danger for our dikes or us behind them, but there are guards keeping an eye on them. So it was a good time to stay in this weekend, although I catched a better moment on Saturday to pop out for the newspaper. During the weekend we spent a lot of time at tv, because of the speedskating and we did well. As well as at the women and men competition we have an European all-round speedskating champion. And it was really exciting too, till the last moment we weren;t sure who would have the gold. Today I really should make some phonecalls to see if I can get some volunteer work, I know lots of places and institutions are asking for them, so I hope to find a place soon. So that will be the main job for me today, may be I will need to make just one call and will be invited to come perhaps for a little interview, and may be I need more. Then tomorrow Jan will have to go to hospital for a scan of his vains, to see how they are doing and Thursday he will have the apointment with the doctor to evaluate. I hope all will be good and that no drastic things will have to be done. I have no freebie for you today, I still have to make a preview of it, so forgive me, but I will have it for you on Wednesday. That's about all for now, I will have a coffee and then start with making phonecalls and such. Quiet but wonderful birthday yesterday! Midnight from Wednesday to Thursday was the moment for me to get into my 62 years of age LOL. Well, as I still was awake then, I got my birthdaykiss from Jan, of course. And I finally could open the present I already received around Christmas. And what a lovely gift that was, accompanied by a beautiful card, all from my friend Edna. She sent me a fantastic afghan she made herself, and I can asssure you it will be heavily used! I was too lazy yesterday to make a photo of it(sorry Edna), bt i will do so this weekend and show it next week. Add to that some lovely e-cards, some phonecalls of good friends, and I was walking almost all day around with a smile on my face. And then I must not forget all the wishes I received in my comment- and shout box fromyou visitors. Thanks so much, they are the little starlights to brighten the day extra! The day went by very quiet, but ever so nice. Jan and I even made a little change to our living room. We moved a little bureau, we had in the bedroom to the living room, (it wasn;t very heavy, don;t worry),so now Jan has a place for his laptop too and can sit warm. He had it on the dining table, but that wasn;t a very good place, that only is good for a moment. Now the table looks nice and and not messy anymore. Great change I must say. Before I helped Jan I went out for a moment, had to get us some things.It was raining, but the temperature wasn;t bad at all. Now today I should do some real grocerie shopping but I am reluctant to do so, looking out of the window. There is quite a fearce wind blowing, and every now and then a rainshower is coming down, so not the nicest weather. perhaps a bit later today the wind will decrease somewhat. Oh, yesterday in the post we had a folder from the government and guess what? Now we have to have an "energy-label"for our home! For the moment we are given a preliminary one, but whenever we want to seel the house we must have a official registered one! somewhere this year( of course as soon as possible) we will have to go to a website, where we can check the data, government filled in and then we will have to chose an expert who will check those data and the ones we might have changed, because we have different kind of glass e.g. in our house. Then, all on line, this expert we give us the official label, which will remain valid for 10 years. and guess what? Nothing is free these days, so it might cost us several dozens of euro's. And no expert is coming to the house, to see changes you announce on the website, no, you will have to deliver photo's or bills yourself all digital. I know, we all have to pay attention to the energy saving, but I am getting a bit tired of the government who meddles with almost everything! But if you don't have the official valid energy label at the time you sell your house( or rent it), you could get a fine of several 100 's of euro! Okay, next week I will check the website and see what i will have to do. Then i just have to pay attention for a moment to the aweful attack on a newspaper in Paris, resulting in 12 deaths at the moment. I was really chocked when I hear and saw about it on tv, and specially the video where you actually could see how a wounded police man was shot through the head. Done so neglectful, mindless, without any mercy by the offenders. I know, assaninations take place over the whole world and almost every day, but this one is an attack on not only just a newspaper and the writers, but also on the freedom of speech and democracy. And all done in the name of a faith. Which is no good thing in any circumstance. But............ how difficult it may be, we must NOT start to blame ALL people who have the same faith, in this case the islam. Because people who do those terrible assasinations and attacks, aren;t true believers, they just use faith to hide behind. It has nothing to do with a faith, they interprete is completly wrong, only to justify their actions. And we should all be very aware of the fact, that the danger is we might think all people of the belief or faith have the same ideas, and tolerate those kind of gruesome actions. That's what those horrible groups want to achive. To get a wedge between different faiths and people. And we must not let that happen. Most people just want to have a normal, nice life, and have no problems with eachother, and we all still have to believe in that and live to it. Toleration is a great word and something to cherish. I will probably never understand, why there are people, who try to put people against eachother, while the world would look a lot better if we just could live our lives next to eachother, each in his or her own way, respecting some laws and respecting another view. To a brighter note we will have an interesting weekend( at the least for us) because there will bethe European Championships Allround speedskating and as you might know by now, we love to watch the speedskating. We have some great candidates who might win the title, although they will still have some heavy competition. Curious to see if some of our skaters will bring some medals home. 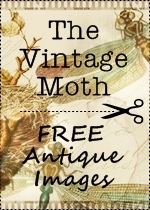 About time now to end this post, not without a freebie! Although my "production " of kits still isn't great, I managed to get one done and perhaps I will have time this weekend(in between the skating LOL) to start another one. 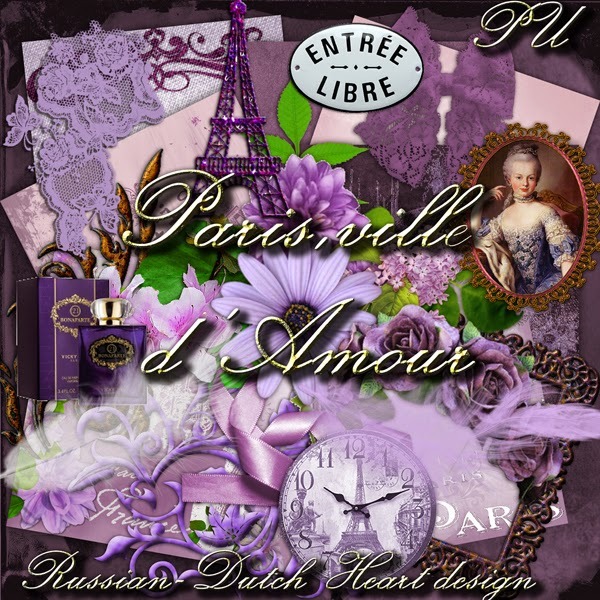 This one is in one of my favourite colors, purple/lilac and has a French theme, named it Paris, ville d'Amour. A wonderful lazy weekend, and not feeling guilty! Oh how wonderful this lazy weekend was, doing almost nothing. We've spent it watching a lot of tv, taking some long naps too, some computering, and it did us real good. But today I really will have to start doing some things here, although I should wait with vacuum cleaning and dusting, because we will take down the Christmas decorations in a few days. We can enjoy them only today and tomorrow( holiday of the Three Kings) and then I hope to dismantle all on Wednesday. It will look really "empty"in our room, and I always have to get used to it again, but then it also will be nice to have all back to usual. So if not doing all too mamy household things today, I just have to pay attention to some more serious stuff, shuld file some important letters and forms, have to make a couple of phonecalls, and I know it doesn;t sound all too much to do, but that are things that always take more time than you have in mind. With such a lazy weekend, you can imagine I don;t have much news to write about, so I better keep this a short post. But I am happy that during this lazy weekend I finished a kit, although the designing still is going too slowly to my liking. Oh, on Friday we got mail from the disability hearing Jan had in December. Our hopes already weren;t too high, but now we have their conclusion: no change in their former conclusion, so Jan is not "fit"for a partly disability payment. Hmmmm, although we were prepared to this answer, it still isn;t great to read. If we want we could still fight it, but then we will have to go to court, and I don;t think ti will help much, and it will cost us too much money on top of it. Going to court, we really should have a lawyer and that will be rather expensive and then the outcome will be still uncertain, so we will have to forget about it. Oh well, we will have to do with the social security money for the time being, and who knows what the year will bring us? Perhaps Jan or I can still find a job, or may be both and that would be wonderful, although not very likely. But we will try to continue thinking positively, and just see how it will go. Finding a job for Jan wouldn;t be so difficult if he still could do health care, but I think that is too straining for him in his condition and finding something else will be hard. Okay, enough about that. The year just started so just let's hope during the year something will come up. You probably noticed my new bloglayout, had to change it from Christmas-look into usual look, and also one of the things I did this weekend. I am quite pleased about it, and love the rather romantic look of it. 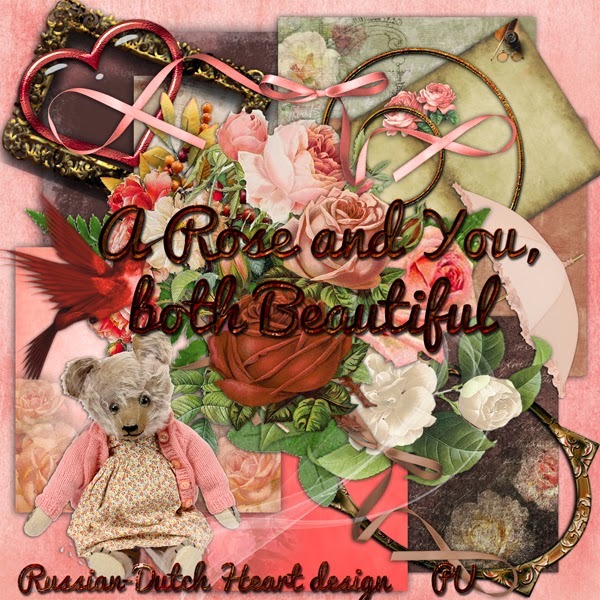 As promised I have a kit for you today, named "A Rose and You, both Beautiful". Time now to do some blogreading, and then will get dressed and start with the things I want and have to do. Just curious to know how much will be achieved today, LOL. Have a wonderful day and let's make it a great year, one way or the other, okay? let me start to wish all of you a Happy New Year! And thank you for all the good wishes you left me, so sweet of you. I think everybody needs a bit of recovery time now after the holidays, well this weekend is a good time for it and then Monday all starts over again, a brand new year, with all kind of things in store, surely, let us just hope most of it will be good stuff! We were still up at mindnight to let the New Year in, and watched a bit of the fireworks at tv, but also in our street and around. I had a view on some of it from the back of the house, looking through the window. Then we watched some more tv, and went later to bed than planned, as always. It was a good thing we were at home during the fire works, for our Brodski. I must say he looked rather quiet, but some noises startled him a bit, so at times he crawled on the couch, between Jan and me, and at times he found a safe little corner, waiting till all was over again. I think he was pooped out a bit from the stress it caused, he did a lot of sleeping yesterday LOL. So yesterday was a very quiet day, but already today usual life starts again, so later today I probably will do a bit of grocerie shopping, and I also think the house can do with a vacuum cleaning. Oh, I must not forget to go to Heidi's house( or I think that will be Jan;s job today), to have a walk with the doggies. She is visiting her mother all day and asked me if we could look after the dogs. She told me also that she is suffering from probably and allergy attack, just after she returned from the Christmas holiday brake. She is covered all over with little blisters, that are itching terrible, and she has no idea where it comes from. She has now medcines and an ointment for it, so hopefully it will get better soon. 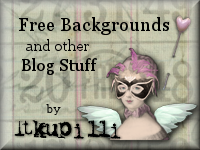 I hope you will forgive me that i don't post a freebie today, I promise on Moday there will be one again. I should get busy soon now, after I do some more blog reading. This weekend we still will be keeping "low profile" in activities, LOL, and next week all sorts of things have to be taken care off again. Wishing you all agian a very happy New Year, that it may bring you the things you wish, but at 1st place a good health!. Having that you are able to deal with things much easier. !